Moldex-Metric 1500 N95 Particulate Respirator Surgical Mask with Ear Loops. 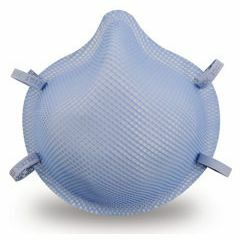 AllegroMedical.com presents The N95 Particulate Respirator Surgical Mask with Ear Loops. The molded nose bridge with soft foam nose cushion provides the wearer an easy, comfortable, dependable fit. There’s no metal noseband to adjust and the seal is maintained without pressure points. Note: For areas with oils present, you must use an R or P respirator.